Before I start this review, I want to clear the air. There are so many people saying: “why bother with a cooler bag? My lunch used to sit in boiling hot sun on 40 degree days and noone ever put an ice pack in mine…and I’m fine”. But like with so many things in life, there has been progress. We have learnt that food should be kept at a certain temperature to prevent bacteria and prevent us getting sick. If you need more convincing, pop over to Cook and Kid and read this post about being smart with food. So cooler bags, they are pretty important. That’s why I’ve decided to review some. But I need to make a disclaimer right here and right now. A cooler bag is only as effective as it’s ice pack. And sometimes the best ice pack for a cooler bag is not the ice pack that is sold with that brand. So my pick for the best cooler bag and ice pack combos? Click on each name for a more comprehensive individual review. So young lunch bag with a decor ice wall- bought separately (or two) or even a fridge to go panel. A fridge to go medium with the fridge to go panel. Designs and prettiness aside, you are looking for good insulation and a size and shape that fits your lunchbox. It’s important that you make sure that you buy one with room for everything you will pack and also that it is easy for your child/ren to open and close by themselves, because you want them to be able to eat their first break, close it back up and keep cold until 2nd and 3rd break. Many of the cooler bags on the market come without ice pack panels, so you’re free to buy your own, but if like me you are lazy and want a ready to go combo, then a medium fridge to go is your best option. The cooling panel is amazing and keeps the food cold for 8 hours. The decor ice walls are another good option and because they are slim you can slide two into a so young bag with a yumbox in it. I’ve seen many people talking about the cheap cooler bags they have gotten at kmart etc. If you’re happy with them, that’s fine, this review doesn’t mean ditch that and go and buy a new one, instead it should give you some idea as to why these ones cost more. The fridge to go panel has still been partially frozen at 3pm in my daughters bag. That means the food is still cold and therefore still safe to eat. If you are going to buy a cheaper cooler bag, do some testing of your own to see if food is still going to be the right temp at lunch time. I was quite shocked to find that a few of the lunchbags I has weren’t very well insulated. That is why the list from my review has shrunk from original planning. I won’t give you options that I wouldn’t actually use. With these bags all around the same price tag I want to do you some maths. I’m just going to leave that there. If the same cooler bag gets two years of use, you’re paying $0.09 per day. And if it gets three years of use… $0.06 per day. I’ve been using tag apple and mint bag for a year and no condensation. I keep it in its grey cover and put it in the special zip section that keeps it separate from the lunchbox – keeps the food cold and comes home in winter still 80% frozen and in summer has a lump of frozen ball still in it when we get home. 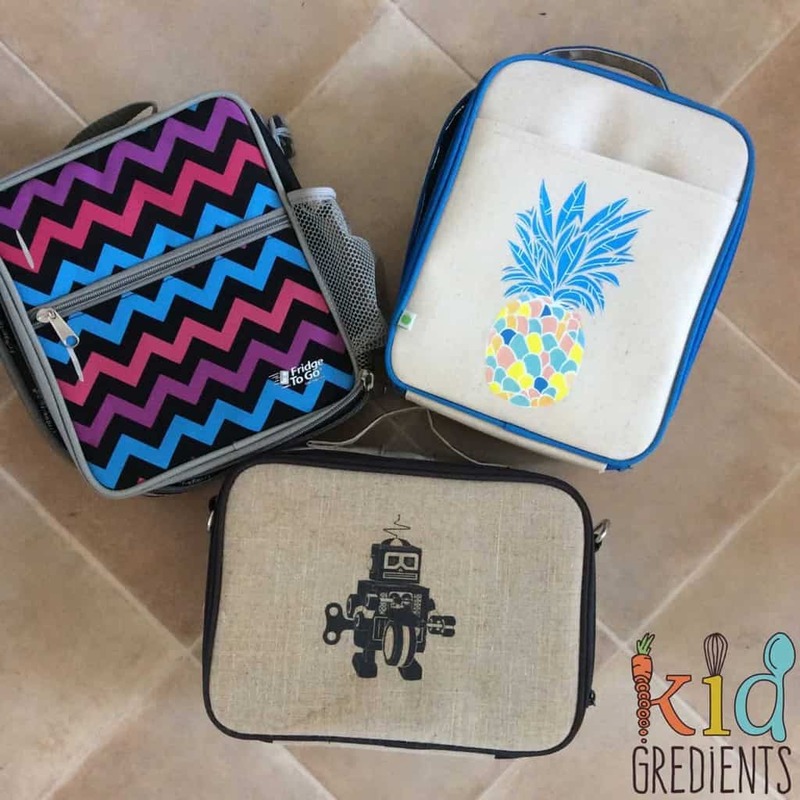 I like the idea of the removable liner on the So Young one as my son eats his lunch with the lunchbox in the bag so there are lots of crumbs to clean out. But would like to know if the liner clipped it as I don’t want to lose liners and ice bricks around the school. The liner velcroes in, works really well for us, my daughter didn’t even know you could remove it until she saw me do it a few weeks back! How about I add that in tomorrow?